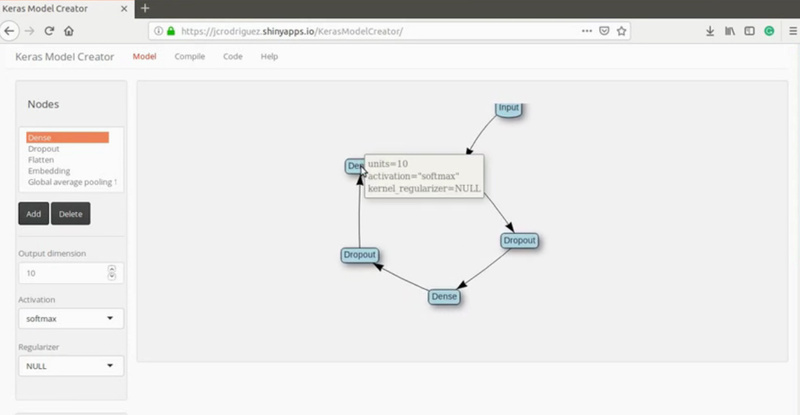 Shiny Contest Submission: [WIP] KerasModelCreator: Visually design Keras models for R language. Visually design Keras models for R language. The idea of Keras Model Creator is based on Deep Learning Studio. Add layers and connections manually. Few network layers already developed. I'm pleased to announce that in the dev branch of KerasModelCreator (alpha) it is actually possible to load data matrices, generate the model, and fit it. The fitting process is being plotted epoch by epoch. And dont forget to take a little tour through the tutorial. Where you can load the iris dataset, and fit it! This topic was automatically closed 54 days after the last reply. New replies are no longer allowed.